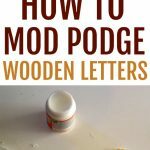 How to mod podge wooden letters! 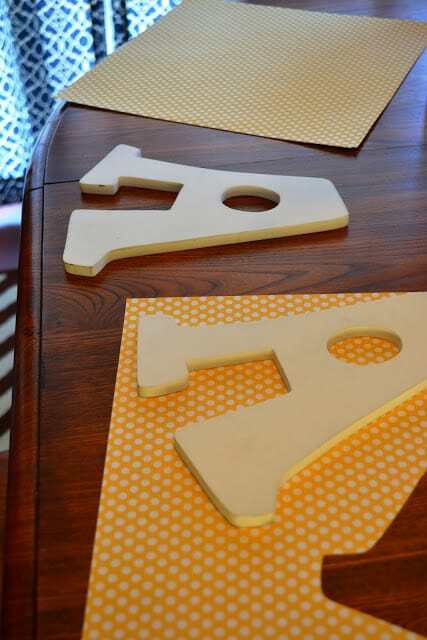 Learn how to easily Mod Podge wooden letters with scrapbook paper using this quick and easy tutorial. Great gift giving idea for nurseries or kids rooms. If you have ever used Mod Podge before, which I’m sure a lot of you have, then you know how it works. 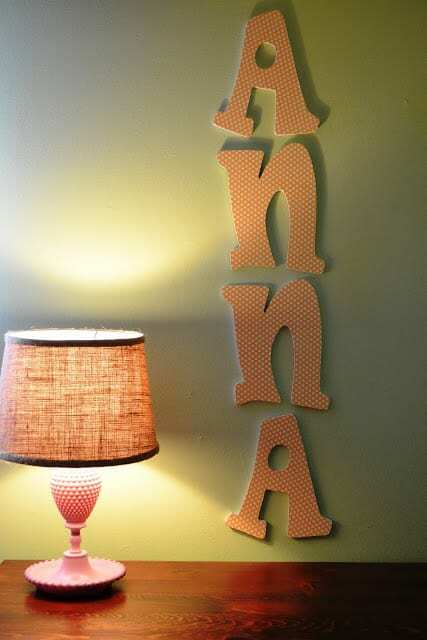 For those of you that have not, here is a quick how-to tutorial using wooden letters. Let me also just say Mod Podge can be addicting, like a kid who wants to glue everything in Kindergarten. Fair warning! I used gloss finish but they have matte, antique, ones for fabric, glitter, etc. There are so many options of Mod Podge available for use. You can just pick your favorite but for this project, I would recommend matte or gloss finish. I used a craft bristled brush simply because I didn’t have a sponge one available. I definitely suggest using a sponge brush over a bristle brush. You will have a much smoother finish. 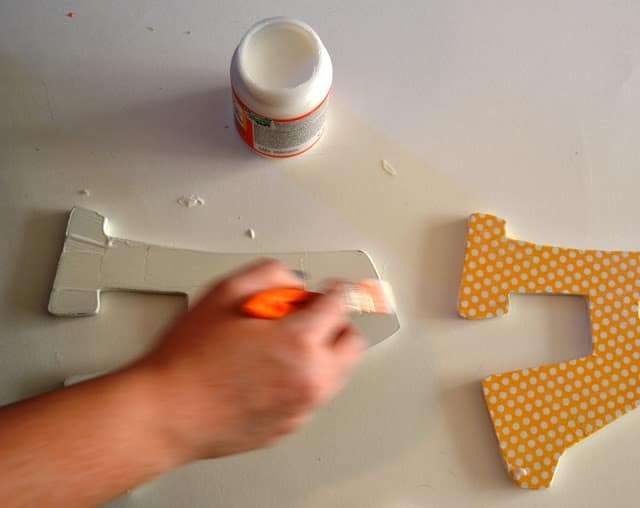 If you use scissors then you will probably at least need a craft knife for harder to reach areas. For example, cutting around the corners of an N or the center of an A. Start by tracing the letter onto your scrapbook paper. NOTE: If you plan to trace onto the back of your paper remember to reverse your letter otherwise you will have to start all over because when you flip the paper it won’t be lined up. 2. Once you have the letter or letters traced then you are going to cut them or trim them with your knife. 3. After all your pieces are ready you will want to spread a layer of mod podge onto your entire letter. I recommend doing only one letter at a time. 4. Place the scrapbook paper letter on top, line up all the edges and press down firmly. If you find that you have any bubbles you can just smooth them out with your fingers. 5. At this point, you can allow your letter to dry, but I always like to put a layer of Mod Podge on top to seal and protect. Then it’s just a waiting game to allow all of your individual letters to dry. Once the letters are fully dry, you can take your sandpaper and sand the edge gently for a finished look. If you find that your scrapbook paper hung over to much flip the letter over and use your knife to trim any edges. You can also coat with an additional sealer to rid of any tacky feel that the Mod Podge tends to have once dried. Does Mod Podge work on wood? Yes! These letters are made of wood. Almost any surface can be used to create a decoupage project, other suitable surfaces include papier-mache, tin, cardboard, and glass. One surface you have to be careful with is plastic. Test a small area if you are unsure. No, it’s not totally waterproof. They do have an outdoor formula that is water-resistant but again not entirely waterproof. If you want to make your project waterproof, I recommend a clear, outdoor acrylic sealer to protect your project. Want to print these tutorial instructions? 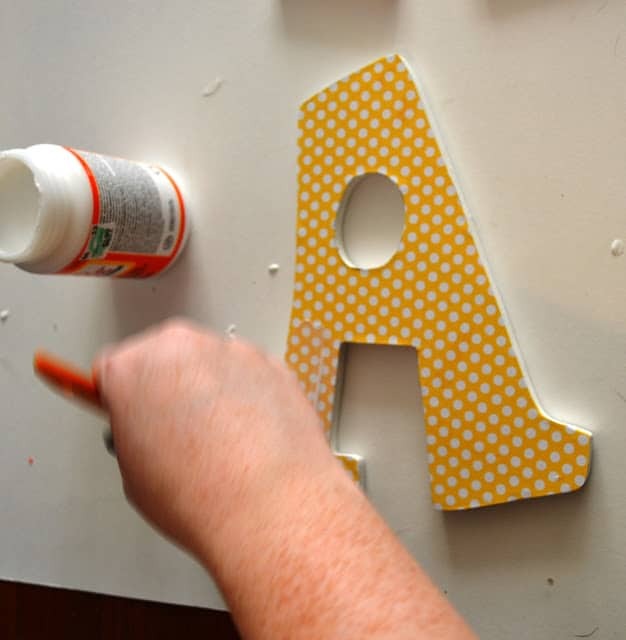 How to decorate wooden letters with paper using Mod Podge. Start by tracing the letter onto your scrapbook paper. See note before tracing! Once you have the letter or letters traced then you are going to cut them or trim them with your knife. After all your pieces are ready you will want to spread a layer of mod podge onto your entire letter. Place the scrapbook paper letter on top, line up all the edges and press down firmly. If you find that you have any bubbles you can just smooth them out with your fingers. At this point, you can allow your letter to dry, but I always like to put a layer of Mod Podge on top to seal and protect. Then it's just a waiting game to allow all of your individual letters to dry. Once the letters are fully dry, you can take your sandpaper and sand the edge gently for a finished look. If you find that your scrapbook paper hung over to much flip the letter over and use your knife to trim any edges.You can also coat with an additional sealer to rid of any tacky feel that the Mod Podge tends to have once dried. If you plan to trace onto the back of your paper remember to reverse your letter otherwise you will have to start all over because when you flip the paper it won't be lined up. Well done! Those letters are supper cute! I have been wanting to do this. These look great. does it matter how thick the scrap book paper is ? Thanks for sharing! 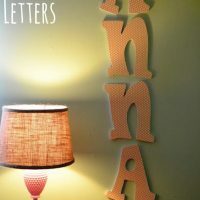 I used this to do letters for my little ones room and they turned out perfectly! I’d never modge podged either, but now I’m excited to try other projects! What a great idea! The wooden letters look amazing and you make it look so simple! Can you modpodge wrapping paper? you know for like presents? But modpodge it onto wood letters?